What was the reason for Roosevelt/s antipathy toward de Gaulle? The Churchill Project - Hillsdale College > Articles > Q & A > Churchill in WWII > What was the reason for Roosevelt’s antipathy toward de Gaulle? What was the reason for Roosevelt’s antipathy toward de Gaulle? Antoine Capet’s review of the Churchill Document Volume 20, Normandy and Beyond, takes as a case study Churchill’s extreme efforts to placate President Roosevelt on the role General de Gaulle would play during the liberation of France. Asked to account for FDR’s great antipathy toward the Frenchman, we queried Hillsdale’s Professor Emeritus William Morrisey, author of Churchill and De Gaulle: The Geopolitics of Liberty. According to Elliott Roosevelt in his book, As He Saw It (New York, 1946), Franklin Roosevelt distrusted de Gaulle for three reasons: one having to do with the status of the French empire, another with the status of the French regime, and a third involving the shape of the French state after World War II. According to Elliot, his father suspected that de Gaulle was another Boulanger or neo-Bonapartist, who intended to use the war as a springboard to dictatorship. FDR is quoted as saying: “de Gaulle is out to achieve one-man government in France. I can’t imagine a man I would distrust more.” (As He Saw It, 73). While it is true that Roosevelt was quite willing initially to deal with such non-republican sorts as Pétain and even Stalin, he needed them; Pétain, for example, seemed to hold the key to North Africa in the early years of the war, and FDR expected to attack German troops there, with Vichy French support. FDR had no need for de Gaulle, or so he thought. It is well known that Franklin Roosevelt didn’t like European empires. At times he regarded de Gaulle as Churchill’s puppet, assuming that because Churchill had provided safe haven for the Free French, the Prime Minister “owned” de Gaulle, “body, soul, and britches,” as his son memorably paraphrased him (As He Saw It, 74). Yet de Gaulle also irritated FDR when he acted quite independently from Churchill. After the Pearl Harbor attack, America intended to negotiate with Vichy over the use of St. Pierre and Miquelon, two islands off Newfoundland. De Gaulle decided to force Roosevelt to choose between Free France and Vichy, ordering Admiral Emile-Henri Muselier to seize the islands. (He could take this risk because he knew American public opinion preferred Free France to Vichy; and that neither Great Britain nor Canada wanted Vichy to control the islands.) Roosevelt had to acquiesce to the fact de Gaulle and Muselier established on the ground. But FDR was not a man to accept even a minor defeat on the geopolitical chessboard with good cheer. De Gaulle’s refusal to cede French control of French colonies to any ally would of course put him at odds with both Roosevelt and Churchill, throughout the war. In sum, President Roosevelt saw de Gaulle as an imperialist, a French statist, and a would-be Bonapartist. He was right about the statism part, wrong about the Bonapartism: de Gaulle was a republican but not a parliamentarian, favoring a strong and independent executive but not a monarchy. Roosevelt was right temporarily, but wrong in the long run about imperialism: de Gaulle didn’t want to give up any colonies involuntarily, but was ready to give them up voluntarily when he became president of France in the late Fifties. As a sidelight, I should mention that Roosevelt’s animus toward de Gaulle may have cost us an interesting movie. Jack Warner was an ardent FDR supporter and pitched in with a number of movies in support of the war effort. One project was The de Gaulle Story, with a screenplay by William Faulkner. Faulkner did in fact write the script, which was published some time ago by University of Mississippi Press. It isn’t clear why the project was canceled; we know that the Warner Brothers executives wondered who in the world might be hired to play de Gaulle, given the Frenchman’s unique physical appearance. My suspicion is that Warner, ever-sensitive to Roosevelt’s sentiments, quietly removed it from his to-do list when he realized that FDR had no interest in promoting Charles de Gaulle on any stage. But I have no evidence for that speculation. Professor Morrisey is correct that broad policy concerns played a role​ in Roosevelt’s view of de Gaulle.​ Much of FDR’s attitude was​ of course​ aimed at France in general. Elliott Roosevelt did describe his father’s thinking, but Elliott was an apologist for his Dad. His account speaks to policy, to the big picture, because he did not want his father to appear petty. FDR, like Churchill, was a firm believer in personal contacts, hence their preference for talks at the “summit.” Both had confidence in their ability to persuade others. Stalin sensed this and played them accordingly (which worked sometimes, but not ​always). Stalin could be a chameleon, ​something foreign to de Gaulle’s personality. Roosevelt, but not de Gaulle, enjoyed the company of pals and buddies, and an atmosphere of bonhomie. The St. Pierre and Miquelon episode, which infuriated Secretary of State Cordell Hull, annoyed Roosevelt, though he did hold Hull back a bit. And the “Vichy Gamble” set FDR and de Gaulle at odds early on. ​But for​ me, the most significant reason for FDR’s antipathy was that he disliked de Gaulle as a person​. The Frenchman was​ someone who set Roosevelt’s teeth on edge. I seem to recall (no footnote) that he called de Gaulle a “cold fish,” a strong phrase in Roosevelt’s lexicon. Dr. William Morrisey holds the William and Patricia LaMothe Chair in the American Constitution at Hillsdale College is the author of several books, including Churchill and De Gaulle: The Geopolitics of Liberty. He has written for The New York Times, The Jerusalem Post, The American Political Science Review, and the Washington Times. 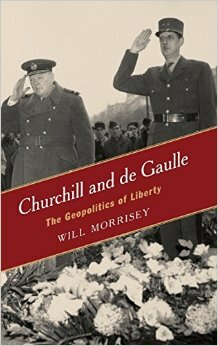 Further reading: William Morrissey, “Where France Stood in Churchill’s Geopolitical Landscape,” Hillsdale College Churchill Project, Part 1 and Part 2.